One thing you can't deny about CD Projekt: It gives good trailer. Killing Monsters, A Night to Remember, Go Your Way, and even the old Cyberpunk 2077 teaser and Witcher 2 intro are fine bits of digital cinema that I enjoy watching entirely for their own sake. The launch trailer for the Witcher 3 expansion Hearts of Stone is a little different from those, since it's more focused on a specific element of Geralt's adventures, but that also makes it more interesting because it's a much more specific look at what he—that is, you—will be getting into. 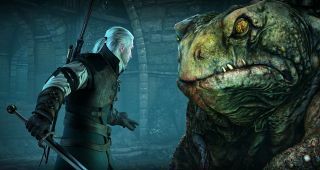 We got some hands-on time with Hearts of Stone last month, and between the giant frogs, wedding crashers, the return of Shani, and a guy who's surprisingly hard to kill (even though he's not named Geralt), it sounds like a lot of fun. And that's just the first two hours! But high-level monster-hunters only, please. The Witcher 3: Wild Hunt "Hearts of Stone" comes out on October 13.